METSAT (Meteorological Satellite), launched by PSLV, is the first exclusive meteorological satellite built by ISRO. So far, meteorological services had been combined with telecommunication and television services in the INSAT system. METSAT will be a precursor to the future INSAT system that will have separate satellites for meteorology and telecommunication & broadcasting services. This will enable larger capacity to be built into INSAT satellites, both in terms of transponders and their radiated power, without the design constraints imposed by meteorological instruments. For meteorological observation, METSAT carries a Very High Resolution Radiometer (VHRR) capable of imaging the Earth in the visible, thermal infrared and water vapour bands. It also carries a Data Relay Transponder (DRT) for collecting data from unattended meteorological platforms. METSAT will relay the data sent by these platforms to the Meteorological Data Utilisation Centre at New Delhi. Such platforms have been installed all over the country. At the time of its launch, METSAT weighed 1055 kg including about 560 kg of propellant. The propellant carried by METSAT is mainly required to raise the satellite from the Geosynchronous Transfer Orbit to its final Geostationary orbit. METSAT will be located at 74 deg East longitude. METSAT has been designed using a new spacecraft bus employing lightweight structural elements like Carbon Fibre Reinforced Plastic (CFRP). The satellite has a solar array generating 550 Watts of power. METSAT's solar array was automatically deployed immediately after its injection into Geosynchronous Transfer Orbit (GTO) by PSLV-C4. In the days after launch, METSAT's orbit was raised from its elliptical Geosynchronous Transfer Orbit to the final Geostationary Orbit by firing the satellite's Liquid Apogee Motor. 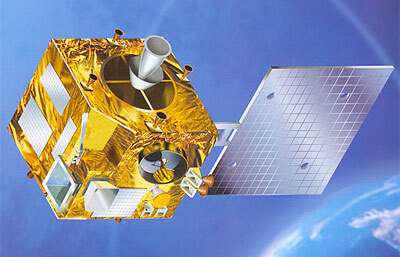 The first orbit raising operation is planned on 13 September 2002, by commanding from MCF. The satellite will be commissioned into service after the completion of orbit raising operations and positioning it in its designated orbital slot of 74 East longitude as well as the in-orbit testing of all the onboard systems. METSAT was developed by ISRO Satellite Centre, Bangalore. The Meteorological payloads were developed by Space Applications Centre, Ahmedabad. On 5. February 2003 METSAT 1 was renamed Kalpana 1 to honour the late indian born astronaut Kalpana Chawla, who died in the Columbia STS-107 accident.